As a proactive Charity we have always had an interest in education, especially about the wonderful breed that is the German Shepherd Dog. So we would like to welcome you all to our brand new venture in the shape of Classroom Canines. Our aim is to set up a network of volunteers and their dogs to visit schools all over the country to not only help children improve their reading skills but to teach them how to read what a dog is telling them hopefully resulting in better dog ownership in years to come. Classroom Canines are going to be offering schools all over the country the chance to take part in one hour weekly visits into schools to offer help to any children who are struggling with their reading and would benefit from a canine friend offering a friendly paw. 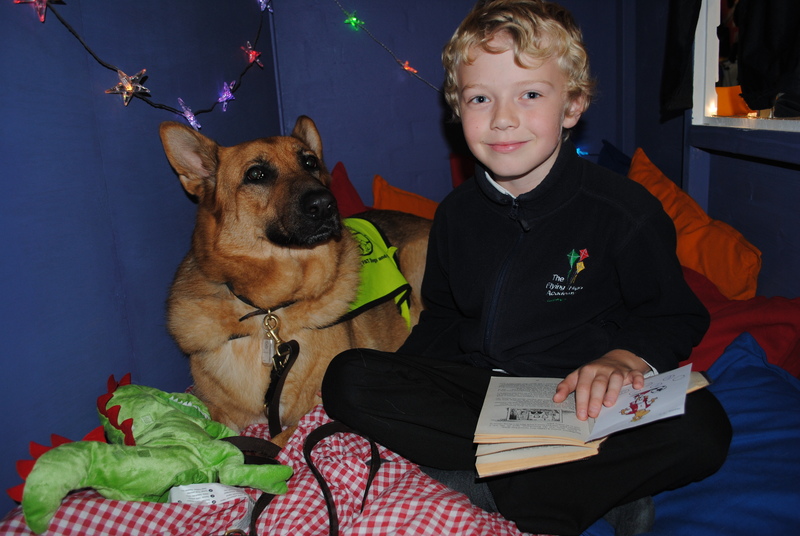 Statistics have shown that children who have been lucky enough to spend time reading with a dog have improved significantly not only in their reading skills but in their confidence too. As we are a charity that survives purely on donations we will be asking that any schools wanting to take part make a donation to GSRE and that at least once a year the children organise a fundraising event where all the donations are donated to the charity of their visiting reading dog (GSRE). Olly Murrs is at present our ambassador for Classroom Canines as he has been doing this for 3 years now and is a massive hit with the children at all schools he has visited. If you think this is something you would like to be involved with then please email us at [email protected] and we will get back to you with all the relevant information. All handlers will be DBS checked, and dogs will undergo a full assessment by one of our suitably qualified dog trainers, with assessments being updated on a yearly basis. We have public liability insurance for all volunteers who visit schools under the Classroom Canines name. We do hope that many of you will see this as an exciting new opportunity to teach the next generation about correct, safe and enjoyable dog ownership.